Santander UK will take funding for Middlesex University students to the £1 million mark, after agreeing a new scholarships programme for the next three years. Since 2010 Santander has provided a range of scholarships to support internships and promote international exchange opportunities and this week (17 May 2016) the bank committed to continue supporting the programme. 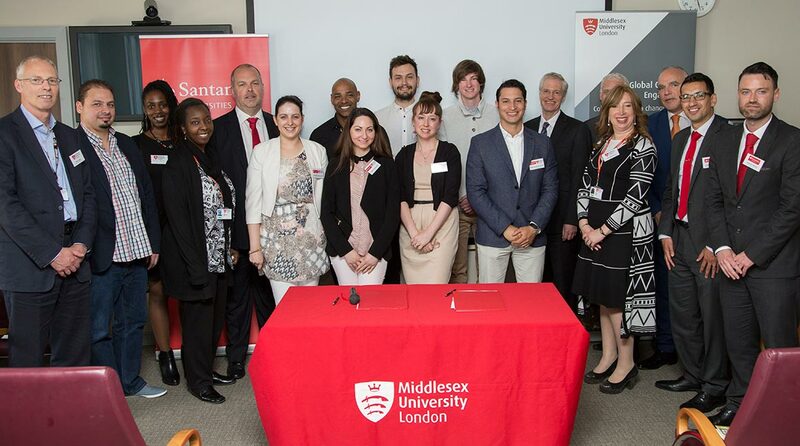 Vice-Chancellor Professor Tim Blackman and Robin Foale, Managing Director of Santander Universities UK signed the new agreement at a presentation at the Middlesex University London campus. “We are immensely grateful to Santander; these scholarships are building the confidence of students and really adding valuable skills to their CVs,” said Professor Blackman. “Over the past six years in excess of 200 students have benefitted from Santander supported excellence scholarships, work placements, support for entrepreneurship, and work scholarships. The signing was attended by students who have benefitted from a Santander scholarship, internship or award, University staff, and representatives of local businesses who have also benefitted from the Santander contribution towards internships. “The renewal of this agreement is testament to the solid relationship between Santander and Middlesex,” said Robin Foale. Learn more about how Middlesex University works with business.